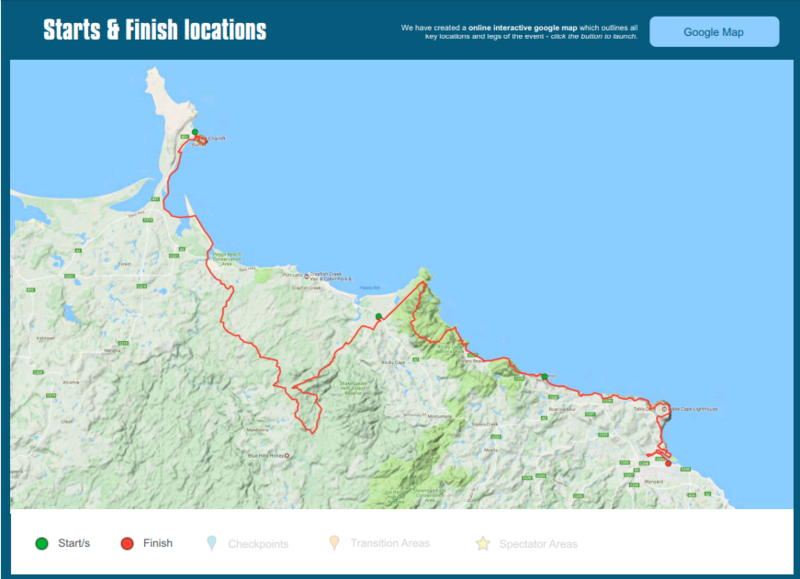 Tasmania's Gone Nuts 101 Adventure Run on Saturday, 2 March 2019 commences on one of Tasmania's most recognized and visited icons, The Nut, at Stanley, in Tasmania's North West corner. The race hugs coastline, climbs through Rocky Cape National Park and traverses rugged coastal bush and calming temperate rainforest, finishing in Gutteridge Gardens, Wynyard, after a breathtaking trip around another volcanic monolith, Table Cape. Both the 101km, 50km races have individual and team relay entries and the exclusive last 25km leg is for individuals only. So that everyone can enjoy Gone Nuts, there are generous cut off times for all legs - even a brisk walk will get you over the line in time! All runners who enter the 100km, 50km and 25km races will receive a special edition Tasmania’s Gone Nuts 101 Trail Run t-shirt. When entering online – please specify your t-shirt size. All t-shirts are to be collected at the race registration desk prior to race day. Race organisers cannot guarantee alternative sizes will be available so please choose size carefully – however we will do our utmost to accommodate. There will be a bus running from Wynyard to Stanley on race morning for competitors. Depending on demand we may run a bus service from Wynyard back to Stanley on Sunday 3rd March. 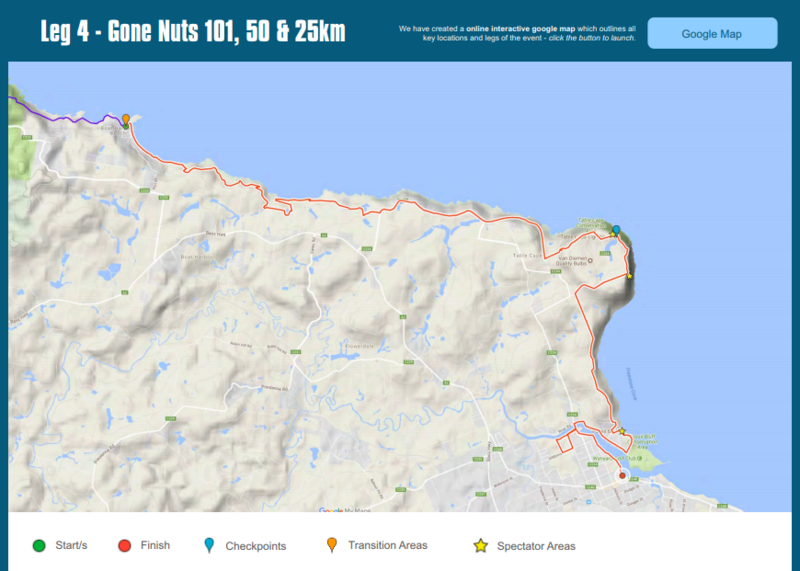 The Gone Nuts 101km Adventure Run will commence at Kings Park, Stanley at 6 am on Saturday 2nd March 2019. It is a long journey – but definitely worth the effort. The 101km course completes all 4 legs detailed below. The 50km course completes leg 3 and leg 4 and the 25km course completes leg 4 only. 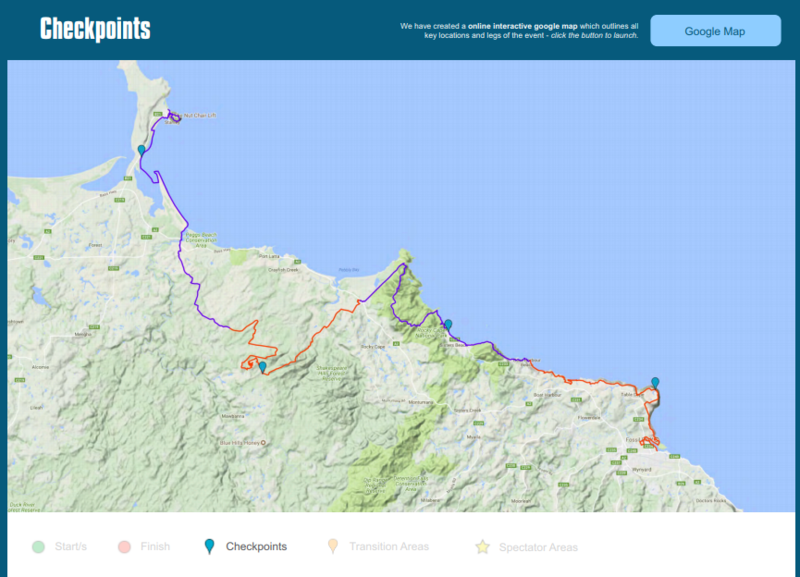 There’s a huge variety of terrain on this leg – single track, hard packed beach, a section of soft beach, gravel road, train line, water crossing and a lap of the Iconic Stanley Nut. However, the water crossing at the Eastern Inlet has been removed for runner comfort and safety. Forestry gravel roads, 4wd tracks, motor bike tracks. Terrain is a mixture of undulating forestry roads, short steep rocky climbs and descents along with mixed terrain motor bike tracks. Special single tack, pristine beaches, technical rocky sections, a short road section and spectacular scenery. Terrain is best described as undulating with a couple of solid climbs and enjoyable downhills. This leg will be a favourite of many. 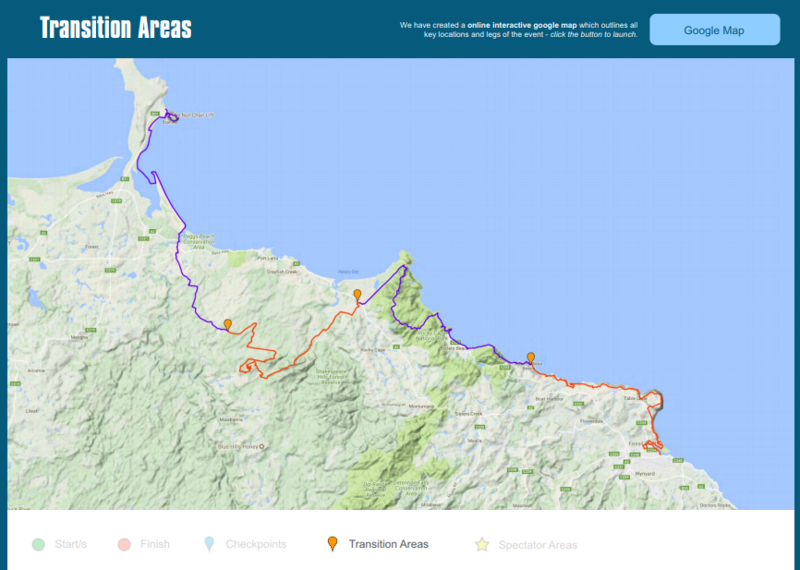 This leg has a huge variety of terrain from beaches and inter tidal zones with some technical terrain over reefs and rocks, farm tracks, driveways, fence lines cross country farm land, single track and a short bitumen sections. 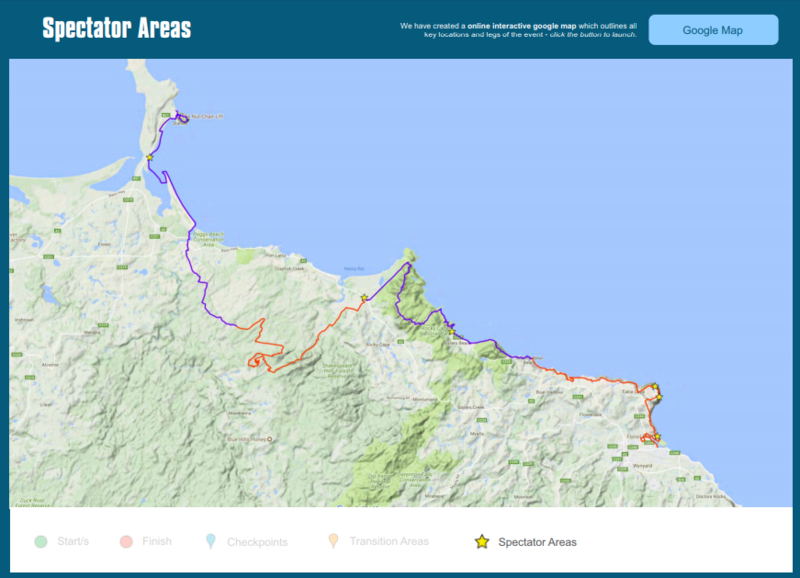 It is undulating with some short step climbs until you reach Table Cape Lookout, from there it then descends to your finish line in Wynyard. There will be a bus running from Wynyard to Stanley on race morning for competitors. Depending on demand we may run a bus service from Wynyard back to Stanley on Sunday 3rd March. There may be a charge for this service - more details will follow. If any competitor does not have support crew/family available for transport we urge you to make contact with us and we will endeavour to assist. Hobart and Launceston airports have direct flights to Melbourne, Sydney, Brisbane, with Qantas, Virgin Australia, and Jetstar. Everyone loves to be supported, cheered and acknowledged. Spectating is a great way to make the job of competitors that little bit easier knowing that you are there cheering them on. Below is a list of the main transition areas where you can support the athletes ( not the only places that you can spectate so have a look at the race map and combine some spectating with a little time in this special part of the world). Just remember, be safe and be aware to other people - don't let the excitement of the occasion make you forget about others around you. Parking: There is a car park beside Kings Park for the race start but also plenty of parking within the town. Toilets: Yes, well maintained public toilets adjacent to the beach. Parking: There is some parking – but be aware this is a very popular area and can become very busy, and the road into/out of Boat Harbour is narrow so take care. Some of the locations are listed below and indicated (Yellow Star) on our google maps. Please see the event website for more information on volunteering. More prizes will be announced in October. There will be NO junior individual entries (under 18years) allowed for the 101km race, however, 16-18yo’s may enter the 101km team events. How was Tasmania’s Gone Nuts 101 Adventure Race?